There may be a perception that the billable hour is still king in the US but that masks the rapid change going on within the start-up scene. Not wanting to miss out on the fun, Legal Geek is holding its first ever international conference in New York – June 25th [check out the latest speaker list!]. And as part of our build-up, we spoke to 5 British businesses (ourselves included) who all have wide-eyed optimism and packed their bags to head to the US in 2019. Rob Wilmot is the Founder and CEO of idea-management software Crowdicity. He was formerly one of the youngest executive officers of a FTSE 100 company, Freeserve, having been one of 3 founding executives. Rob is a headline speaker at Legal Geek North America and is a TEDx speaker. Why did you launch in the US? RW: We launched in the US about a year and a half ago because we were seeing growth in our American customers and we needed to move closer to their time zone. We also wanted to provide a technical capability to be more responsive around the clock. Since then we’ve been building on that customer base through the advantage of being in the US. What was the plan (in a walnut-sized nutshell)? RW: The plan was to get a foothold in the American market through establishing a presence in Boston and New York. Some of our clients in America include the business and financial software company Intuit, supermarket chain Meijer, Schroders, and Sterling National Bank. We also work with a number of law firms around the world, and part of the reason behind opening an office in America is to build on our current relationships and secure new customers in the legal sector. And the plan has worked, so we’re now scaling up. How does the US Technology market compare with other major hubs? RW: To assess the spread of global technology markets, keeping an eye on the activities of venture capital and private equity firms is a good barometer. I think the US is still a leader in terms of investment in technology-based enterprises, but the UK is increasingly being seen as an opportunity by many US-based VCs and investors who are opening up for business in-country. So that’s a great sign for the UK tech space. Ben Freeman is the Head of US at Tessian, a human layer security platform that automatically prevents highly sensitive emails being sent to the wrong people with minimal end user disruption. Tessian are also one of three headline sponsors of Legal Geek North America. Why are you launching in the US? BF: Some of Tessian’s earliest adopters were US businesses. The fundamental drivers for implementing our technology – the need to reduce reputational risk, protect firm IP, and comply with various regulatory and client requirements – exist to a great extent in the US. Launching in the US was the best way to serve existing clients, develop new relationships, and show our commitment to what will become our largest market. BF: Opened a New York office in October 2018 as our North American headquarters. We are re-building the business again in New York, as opposed to operating it as a satellite sales office – everything, apart from engineering, will exist in America too. The team is currently five people and will grow significantly in the coming months. 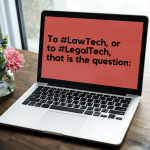 BF: The US legal tech market is very comparable to that of the UK’s and Europe’s in that it is made up of a close-knit group of peers who freely communicate, championing the good and dismissing the remainder. The same technology vendors tend to serve law firms globally. The network exists, as in the UK, thanks to a cohesive network of associations, conferences, and working groups. Needs are driven by clients in the US to a greater extent than elsewhere in the world. Mike Jones – CEO Americas at ThoughtRiver, a contract intelligence software for the legal sector which uses machine learning to scan contracts and legal documents and presents the information in an online dashboard. Mike Jones: We have a unique contract pre-screening platform aimed directly at the legal market with a focus on supporting large in-house teams. Having successfully attracted several major global customers based in the US, we wanted to get closer physically to enhance our support whilst also expanding our footprint into the largest legal services market in the world. MJ: We are setting up our first centre of excellence, based in New York, offering sales, support and contract intelligence expertise. As well as offering this dedicated support to US customers, we will offer exciting partnering opportunities to legal service providers and law schools as part of our Lexible programme. How does the US Legal Tech market compare with other major hubs? MJ: The US Legal Tech market is a hugely exciting opportunity for all providers, including ThoughtRiver. Not only is this the largest market in the world, it is also one of the fastest moving. It has been unfairly described recently as a “bubble” but for us customer success is already a proven reality. David Howorth is a Co-Founder and Director of Avvoka, a digital platform built to streamline the process of generating contracts by enabling businesses to automatically create, e-sign and store contracts online. DH: We’ve seen a growing trend amongst our clients in the UK – law firms and in-house legal teams – introducing their teams in the US to our technology. We’re finding our client base is spread everywhere now, so it makes sense for us to spend more time internationally as well. DH: We decided New York was a place we needed to spend more time in after heading over there through our involvement with A&O’s Fuse innovation hub. Our next visit is going to be for the Legal Geek North America conference in June and from there we will establish what our presence will look like going forward. It’s certainly our intention to establish a permanent presence in the US. DH: It probably goes without saying that the US Legaltech market is huge, but it also has its own challenges. Geographically, it’s far more spread-out than the UK or Singapore. If you have an office opening up in Singapore you can quite quickly service the region. But if you are opening up in New York, you are still 6-7 hours away from the west coast. There are also nuances to working with legal teams in the US – everything from the format of documents, to transaction processes, to the regulatory environment. Any technology that wants to be a success here, needs to take that into account. Jimmy Vestbirk is the Founder of Legal Geek, which he started after hosting his first LegalTech meet-up in the basement of a startup warehouse in San Francisco in 2015. Since then, Legal Geek has redefined LawTech events in the UK and Europe. 30% of our readership has always been in the US and we also get a lot of in-bound requests from people wanting to find out if events similar to the Legal Geek Conference in London exist in the US. On June 25th we can say ‘yes they do’! We want to build a US LegalTech community around our event which will allow attendees to see value long after the event. We want to have fun with this year’s inaugural event and build on the significant buzz that already exists around LegalTech’s potential in the US. In future years we want to grow the event to around 1000 people who have a mindset to embrace technology for positive change on the profession. In 2018, Legal Geek went on an Around the World Tour, visiting Moscow, Singapore, Melbourne, Sydney, and San Francisco in 5 weeks. We also visited New York and Toronto separately. We chose New York for our first conference abroad because geographically it’s a global hub for the legal sector. It’s possible for attendees to combine a trip to New York with other business and there is a very positive groundswell around LegalTech in the city and surrounding area.